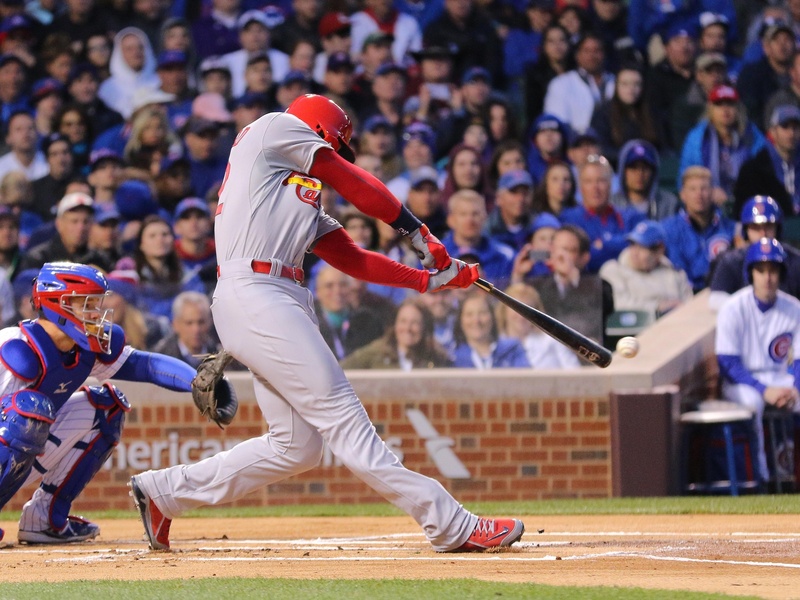 Unless you’ve been living under a rock since the Cubbies eliminated the Cardinals from the 2015 MLB postseason, you’re probably aware that Jason Heyward recently departed St. Louis in free agency for a certain *hated* rival. Chicago formally introduced the J-Hey Kid on December 15; he wasted no time in taking a veiled swipe at his former employers, noting the aging core players in St. Louis as a big reason in his decision to pack his bags and head north. As you might expect, Cards manager Mike Matheny took exception to this characterization of his ballclub. But while it might seem, at first glance, that the Cardinals stars–Adam Wainwright, Matt Holliday, Yadier Molina–are ancient compared to the Cubs’, was there really that sizable a gap last season, and did it really get worse this offseason? According to Baseball-Reference.com, the Cardinals entire 2015 roster, whether participating in 155 games like Jhonny Peralta or 1 like Marco Gonzales, Nick Greenwood, and Dean Anna, had an average age of 28.4 years–27.8 among pitchers and 28.5 among position players. The Cubs were an average of 26.5 years old among position players and 29.5 years on the hill, for a total average of 26.7 years, or 1.7 years younger than the Cardinals. Together, these eight position players average 29 years and 3 months. Twenty-five years and 10 1/2 months. Even when accounting for any and all position players who appeared in more than 81 regular season games, which replaces Matt Holliday with Randal Grichuk for St. Louis and adds Chris Denorfia to Chicago’s list, the Cubs still hold an advantage of about a year and a half. When you start to look at pitching, however, the Cardinals seem to be more in-tune with any sort of “youth movement.” After Adam Wainwright tore his Achilles in the third week of the regular season, John Lackey, 36, led a group significantly younger starters for the bulk of the season. Lackey, together with Michael Wacha, Carlos Martinez, Lance Lynn, and Jaime Garcia, were an average of 27 years and 7 months. Furthermore, occasional starters Tyler Lyons and Tim Cooney were 27 and 24, respectively. Additionally, four Cardinal relievers appeared in at least forty games on the regular season; three of the four (Trevor Rosenthal, Kevin Siegrist, and Seth Maness) were no older than 26 at any point during the season. The Cubs’ pitching staff, meanwhile, was *significantly* older, especially in the more prominent roles. The four starters who barely missed a start the entire season–Jake Arrieta, Jon Lester, Kyle Hendricks, and Jason Hammel–were an average of 29 years and 3 months old in 2015. The fifth most-used starter, Dan Haren, was the oldest starter in the rotation following his trade from Miami before the deadline; he pitched for St. Louis over a decade ago! Moreover, the six relievers to accumulate at least forty appearances on the season were an average of two months shy of 29; technically, that’s only slightly older than the Cards’ pen, but if we throw out crazy outliers like Randy Choate, who’s old enough to be Kris Bryant’s father, the Cardinals are overall younger on the pitching staff. The other means by which to view Heyward’s recent comments are to look forward to 2016: how old are the projected lineups for each ballclub? Because, after all, that’s more or less what he was looking at, whether intentionally or no. Twenty-nine years and nine months… ever so slightly older than 2015’s most commonly-used lineup. But, technically, slightly younger without Heyward; since Holliday was going to start irrespective of Heyward’s presence, Piscotty or Grichuk, both of whom are younger, vaulted in to the starting lineup with #22’s departure. About two years younger than the Cards’ projected lineup. But what stands out to me, more than anything else, is the acquisition of Ben Zobrist. Pretty old for a “youth movement”-oriented team, no? RotoChamp also projects likely or possible starters. Wainwright, 34; Wacha, 24; Martinez, 24; Garcia, 29; Gonzales, 24; and Lyons, 28, populate the Cardinals’ rotation. Together, they’ll be an average 27 years and two months old come Opening Day. The Cubs, meanwhile, got older when they acquired John Lackey, 37, after he chose not to re-sign with the Cardinals. He’s joined by Arrieta, 30; Lester, 32; Hendricks, 26; Hammel, 33; Trevor Cahill, 28; and Adam Warren, 28. This projected rotation will be over an average of 30 years and six months old on Opening Day–more than three years older than the Cardinals starters! Ultimately, it’s not terribly difficult to understand why Heyward chose the Cubs. When it comes to the age of core players, there’s substantially greater hype surrounding Cubs position players like Bryant, Rizzo, Schwarber, and Russell when compared to the Cardinals trio of Wong, Piscotty, and Grichuk. But let’s not forget the tear the Cardinals starters, even without Adam Wainwright, were on for the first few months of the 2015 season. Perhaps even more important is the common knowledge with any sport involving free agency. Once a team loses that ability to almost unilaterally control the contract to which younger players are entitled, it’s faced with a tough decision: pay the player what he wants, or let him walk in free agency. Prior to that, some players are able to state their case at an arbitration hearing and their team is almost always required to pay more than they were paying under the player’s initial contract. And, of course, Cardinals fans also have prior history to fall back on. The team, despite several roster turnovers, has generally exceeded expectations for a market on the smaller end of the spectrum over the past two decades, and there’s no reason to believe that will suddenly cease. Likewise, we can only hope Cubs fans’ hubris over their young players leads to a karmic repeat of the era of good feelings that Kerry Wood and Mark Prior ushered in and Dusty Baker quickly dashed a decade ago. you should add the little icons to share the posts on social media.